I’m not sure how it happened, but Rokk somehow almost made it to 76 in one day. 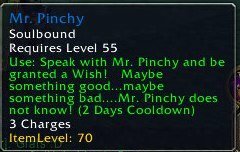 Granted, that wasn’t fully devoted to leveling at the time. There was plenty of RL stuff involved – family time ( + rep there), gym time (cause not all gamers are fatties, fatty), and chores (those gutters won’t clean themselves). Then there was some auction house goodness (damn you Epic Flying) on top of it. Yet somehow, Rokk stands a few bubbles away from 76. That wasn’t easy. Once midnight rolled around, I was just throwing myself at quests to finish them. Didn’t read them, didn’t care. Just grind, quest, finish, rinse, repeat. I did consider taking my mind off things with some fishing, and ended up landing Mr. Pinchy on my third cast. With a Fishing skill around 240, that was crazy luck. Naturally that luck didn’t hold out when I made my first wish. Hey, you’re not a cute pet! Why are you not a cute pet?! 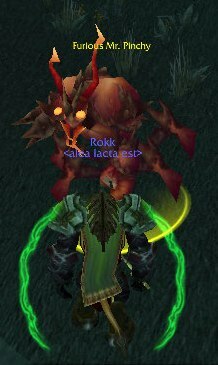 Why are you attacking me, stupid combat non-pet!? After running headfirst into the game for seven hours straight, I felt like I should write something despite having what feels like some degree of brain damage. Yet here I am, blogging with the words and pictures – screenshots no less! That’s dedication, kids. In fact, I was so impressed with this post that I sent a copy to my good friend Lindsay Lohan. I bet she was thrilled to read it! Posted on July 11, 2009, in Blog. Bookmark the permalink. Comments Off on When Wishes Come True.